Would you like to review the content of the sessions you have attended? Some speakers have made their material available to you, so feel free to download it. For dyslexic students learning a foreign language is a somewhat stressful situation which can result in failure, demotivation and subsequent behavioural problems. True inclusion is about feeling accepted and involved in a worthwhile learning experience with the teacher managing dyslexia-connected problems through the Multisensory Structured Language Approach (MSL). Speaking has always been an area that intimidates all non-native users of English. This presentation explores different speaking homework tasks for intermediate level students as a way for them to improve on this skill. Participants will be shown how to use VoiceThread to improve non-native students’ speaking performance. How critical reading, writing, and speaking can be reimagined to decenter the prevailing hierarchies of NS privilege allowing students to transform power structures through a discussion of JCU’s, ‘Italy Reads’, ‘Italy Writes’ and ‘Italy Pitches’, which collaborate with NNESTs to help students acquire the communication skills needed to do this. 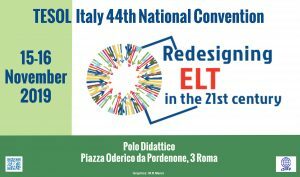 After three years of teaching CLIL courses at a L.S. in Minturno (LT), a History teacher and a Physics teacher illustrate their experience on how CLIL motivated their students’ and FL learning. Statistics, feedback, and other relevant data drawn from case studies show how classroom challenges can be dealt with. The aim of this talk is to raise teacher awareness of today’s polycentric nature of English, to view language variability through the lens of English as a Lingua Franca (ELF). Examples of Network-based Language Teaching (NBLT) indicate that the learner’s competence should be measured in terms of their lingual capability (Widdowson, 2015) rather than their conformity to native speaker norms. Teaching through English as the medium of instruction (EMI) often requires experienced lecturers to venture into unchartered territory. While confident in the teaching of disciplinary content, these NNS EMI lecturers find themselves needing to develop both linguistic and pedagogic competence to address the academic literacy needs of their students in the international classroom. In this presentation, I will address the need for NNS EMI lecturers to develop minimum competence skills for EMI and discuss the lecturers’ changing roles. What do a child’s letter to a politician and a video on power posing have in common? How can you help your students to succeed in a global world? Join me to find out how to create your own life skills lessons (and get some tips for ready-made lessons too). How can learning questionnaires, with an anonymity option, foster learner engagement in a university EFL/ESP classroom? This session discusses and encourages reflection and practice about positive outcomes from questionnaires as a way to expand classroom borders. We look at how, when, and why to use questionnaires as tools of empowerment.